I was one of the lucky ones. As a Senior Manager at a top consulting firm with a 4 year-old son and twins on the way, I was offered options. The firm was very serious about providing a family friendly workplace, so I could have taken maternity leave and then come back to flexible assignment. With twins on the horizon, I decided to leave, but felt fortunate that the choice was mine and I had great options should I decide to stay. Many parents don’t have it so easy, working for companies that don’t have family friendly workplace policies, and forced to make difficult tradeoffs to achieve work/life balance. After my twins were in preschool, I explored options to get back to work and decided to start my “career 2.0” by working in social media. Writing and consulting projects in social media offer the flexibility to work at home, but there were, and years later still are, many tech events and meetings that I needed to attend. so I did the juggle of working with my husband’s work schedule and finding a sitter. I was lucky to have a husband who contributed an equal partner in parenting, as well as a mother nearby and some reliable sitters available. While our family’s work-life balance was truly a balancing act, with multiple support options available I have been able to pull it off so far. In my book, “My Parent Plan“, I talk about the process of planning for childcare. Even if it is well anticipated and managed, it is still a challenge because there is never an easy solution to manage both the anticipated and unanticipated in life. Balancing the schedules of younger kids needing a sitter, as well as working through after school programs for older kids, is sometimes nearly impossible to plan. 1. Use the power of local communities: I would love to see each local community accept the responsibility of helping organize local (safe) afterschool programs. There are so many people out of work (including teachers). What if local governments could help match qualified local professionals with nearby afterschool programs. Communities could team up with fitness centers (such as the YMCA or JCC’s) to use available space for needed family services. 2. Take Your Kids To Work (when possible). Let’s face it, not every workplace is a good fit for parents to share with their kids (and many kids are in school all day). How about expanding telecommuting options so if it fits with the job – parents can utilize all the modern communication technology out there and work from home more often. Or what if some conferences and workplaces that were flexible offered childcare, allowed parents to bring their kids or offer supervised activities for kids? After years of seeing parents taking their kids to the BlogHer Conferences, I was not surprised to see yet another year of childcare announced for BlogHer13. BlogHer is a great role model for incorporating a family friendly “conference” environment. To help move the discussion of family friendly work environments forward I want to call on the power of social media to share #FamilyFriendlyWork success stories. I hope this will ignite the discussion and show that creating a family friendly workplace is possible. Keep in mind, I do believe a family friendly work environment does not mean everyone should bring their kids to work, it means that parents can have the support to either find the right childcare or include their kids in relevant work experiences when possible. What better way to inspire our own kids to create their own career goals? Please comment below with your family friendly work environment ideas, success stories or links to blog posts (or any social media) or websites that discuss this. For those parents that want to share links to pictures of their #FamilyFriendlyWork please do so. It can happen! 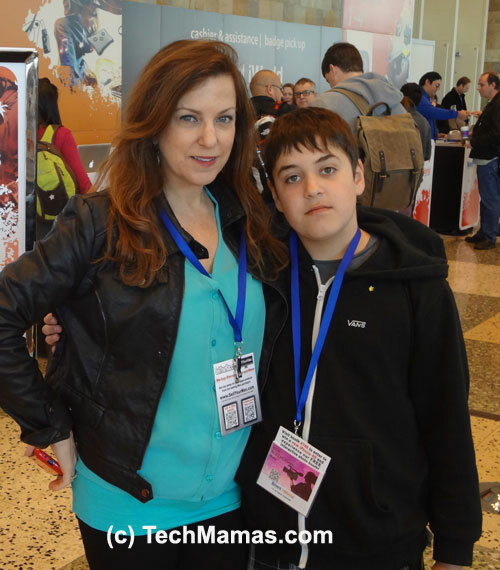 I took my 14 year old son to a tech conference (he even received his own press badge) as my cameraman and video editor! If you post or share, please use the hashtag #familyfriendlywork and share your ideas (and links) as comments to this post. My wish is that all workplaces were flexible about where work is done. Some face to face meeting is needed, but not all work needs to be done in a traditional office. I’m always surprised in Silicon Valley when some companies fear dropping the old model. Also, not all work has to happen consecutively. Again, sure, work sometimes needs to happen in blocks, but not all of it needs to, especially in social media where things happen 24/7 and not 9-5. My ideal job is when they tell you that something is needed by a specific time and leave you to work out the whens and wheres, as long as quality work is delivered when promised. Thanks for writing about this Beth. I have worked in many kinds of environments since becoming a mom and I learn something new every time. A few years ago I worked in a large company where employees were either single with no kids or married with grown kids with a few of us sprinkled in between who had young children. Another employee and I figured out that those in upper management were able to make it “work” while still having young kids, but those of us who were not didn’t have that option. One of the managers went on maternity leave and when she returned was able to arrange to work one day from home. SOmeone below her in the same department was shot down for asking if he could bring his daughter to work one day ONE time. SHe was an older child who would have happily sat in her dad’s office and colored or read . HE was told this would be “unprofessional” even though he didn’t deal with the public at all and it was rare for anyone to go in his office. This was a non profit, people worked there because they loved what they did, not for the money. It seemed to me being a little more family friendly would have been the right thing to do. The message I took away was that if you were high up you could bring your kids, or easily work from home even though you could actually afford childcare. If you were low on the totem pole you basically had to fork out almost more than you made for childcare because you weren’t going to be accommodated. The place I work now is the opposite. We are a small organization but I can work from home whenever I want to or need to. If I have to call in at the last minute because a child is sick it’s not a problem. My boss was always a working mother and is now a working grandma. She likes to hire parents because she knows she needs flexibility and wants to work with those who understand that. One day she came in with her baby grandson and 10 year old granddaughter because her daughter had to work and she needed to baby sit. AS she was leaving to finish the day from home we were chatting about work and I said, “You have a lot on your plate, it’s a big job.” Her response was, ” Now I have to do my most important job, the grandma job.” Another time when I was telling her about issues with my son I said, “So that’s my other job,” and she said, “That’s your most important job.” This is the kind of work environment I want all parents to have, we all deserve it and so do our kids. I love your ideas about improving things. Is there a way we can all work together to make it happen? Great post! I was with an organization for 18 years that was very family friendly. Then I left for a high-flying job…that was not. What a way to find out the difference. After two years? I said “enough!” Now, I’m at home, writing and consulting…and making dinner. It’s quite the change after being on the corporate treadmill for so long…but I’m figuring it out. ‘get’ the whole geo-location thing. And insist that you need to be down the hall. One way to change minds is to do exactly what you’re asking us to do Beth, the other is enlightening senior management that ROI will not diminish. I still wish the simple model of quality childcare at places of work (where safe, of course) were the norm.